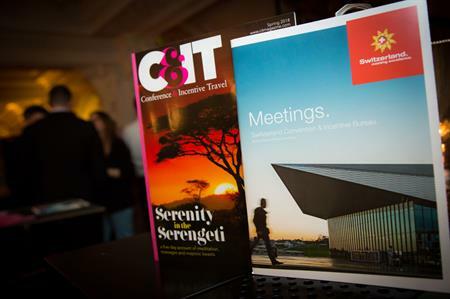 C&IT held its annual SOTI Incentives Dinner for agency directors at the London Edition, in partnership with Switzerland and BE! Tourism. The Incentives Dinner took place last night at the London Edition, part of the Marriott International Luxury Brands group, giving top agency directors the opportunity to discuss topics raised in the State of the Industry (SOTI) Incentives Report. Among the topics up for discussion were personalisation, budgets and transformational travel. Guests were greeted with gin and jasmine tea cocktails and canapes on the balcony overlooking the grand lobby of the hotel. After a short networking session, they were led into a private dining room where bottles of red and white Swiss wine were served. A prawn cocktail starter was followed by roast chicken with creamed mushroom and spinach and coconut panacotta for dessert. One agency MD said: "Clients are expecting more for their money on shrinking budgets. However, saying this, they aren't necessarily looking for experiences with an obvious wow factor anymore. It's become far more about offering them experiences which help their staff to transform and grow as both employees and individuals." Another agency director added: "It's all about the bragging rights now. Delegates want to have an experience in a destination that not every tourist who visits will necessarily get. They want to immerse themselves in local culture, and this can be something as simple as joining in the local sport with the locals or sitting around a table with them to enjoy a traditional meal." On the subject of unique experiences, another guest said: "The destination doesn't have to be unheard of, tropical or far flung, as long as the activities there are exciting and original."